Here's a newly acquired recording that may capture your eye and ears! I try to find anything new by Gottschalk whever possible. He was, after all, America's answer to Franz Liszt! There are a number of world premiere recordings on this disc, with most of the music somehow related to Gottschalk who, himself, was inspired by other composers on this disc. Gottschalk loved Cuba and spent a great deal of time in that country. The instrument uses an excellent Steinway & Sons piano — as we would expect since that's the name of the label! 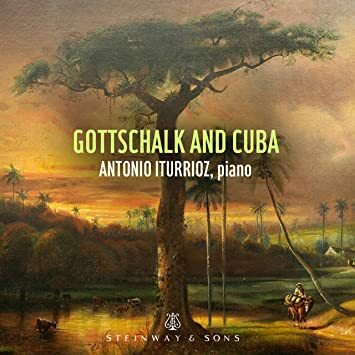 — and my initial reaction was that Mr. Iturrioz is somewhat of a banger at the keyboard. 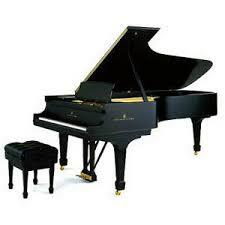 On the other hand, the music in many cases, requires a big, sonorous sound, which the piano gives. But Iturrioz certainly plays well and makes an impression. 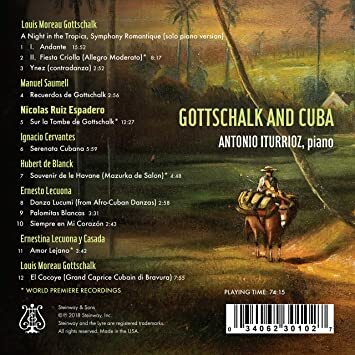 The gatefold album is well done, with extensive notes, and of the Gottshalk pieces, the A Night in the Tropics has a world premiere recording of the second movement (Fiestea Criolla) based on some of the original manuscript for two pianos and that's how this section became a first recording. I was not as in awe with this piece, preferring to hear the orchestral version, but was impressed by other items thereon. If you're curious, go after this new release!